Building a new home can be a great adventure – it’s an opportunity for a fresh start and a welcome transition to meet the needs of your family and lifestyle. But when the initial excitement subsides and reality sets in, the onslaught of decisions that need to be made can be daunting as you choose grout colors, cabinets, appliances and make what might seem like an endless array of other long-term decisions. The Studio by Ashton Woods offers a much different, more personalized, more inspiring experience for home buyers. As the only home builder in the area with a full design studio, Ashton Woods Homes and its design consultants guide buyers through the process of choosing finishes for their homes that reflect the unique people who live in them. Ashton Woods Homes, which broke ground in the Charleston area in 2013, is currently building in Mount Pleasant, Daniel Island, James Island, Goose Creek and Moncks Corner. The company, which was recently recognized as the #1 Most Trusted Builder in America for the second year in a row by the Lifestory Research 2014 Most Trusted Builder in America Study, creates personalized floor plans with an emphasis on style and design and a focus on great customer care. The Studio follows the same principles as it helps buyers make their interior selections. The Studio, located on Daniel Island and designed by world-renowned interior designer Anna Simone, boasts interactive vignettes to give customers the opportunity to visualize and use many of the available fixtures. A working kitchen, a centerpiece in the bright, open gallery, is used for appliance and cooking demonstrations. Various kitchen and bath vignettes are staged in galleries as if they were being used in a home, allowing clients to develop a true-to-life understanding of the products. When making selections for items such as tile, hardwood, cabinets and backsplash, designers at The Studio guides buyers through a process designed to take the stress out of an otherwise fun and inspirational part of the home buying journey. Thousands of design options are showcased, including lighting, countertops, plumbing fixtures, flooring, backsplash and more. A touch screen allows clients to see additional options that aren’t on display. The Studio carries quality brands such as Moen faucets, Savoy House lighting, Timberlake cabinetry and Whirlpool appliances. “Ultimately, we are here to make sure each and every one of our home buyers enjoys the journey of building a home. 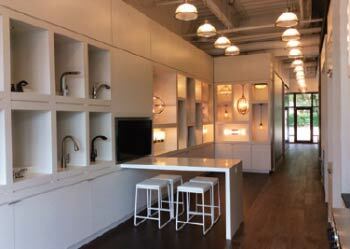 They are able to see, touch and even use many of the interior finishes and fixtures available here in The Studio. That makes the decisionmaking process easier and results in a personalized home that fits their needs and is a true reflection of their own inspiration,” Cooper said. For more information, visit www.ashtonwoods.com.